Washington, May 31 (Just news): The right-hand man to North Korean leader Kim Jong-un has met US Secretary of State Mike Pompeo in New York to discuss a historic summit. Gen Kim Yong-chol dined with Mr Pompeo after flying in from China, and the two are due to meet again on Thursday. Scheduled to happen in Singapore, the historic meeting between Mr Trump and Kim Jong-un would be the first between sitting US and North Korean leaders. What do we know of the first meeting? On Wednesday evening, Mr Pompeo and Gen Kim arrived separately at a building close to the UN headquarters. Emerging later, Mr Pompeo tweeted: "Good working dinner with Kim Yong Chol in New York tonight. Steak, corn, and cheese on the menu." Ahead of the meeting, Mr Pompeo had set out the US position. What other talks are going on? North Korea's Deputy Foreign Minister Choe Son-hui is continuing to meet Sung Kim, a former US ambassador to South Korea, at Panmunjom on the border between the two Koreas. These talks have been continuing since Sunday with some long breaks. The two diplomats have faced one another before during previous denuclearisation negotiations. 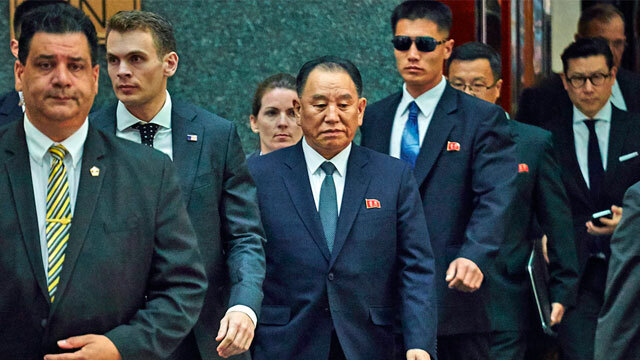 In Singapore itself, a US team led by White House official Joe Hagin is thought to be meeting Kim Chang-son, the de facto chief of staff to the North Korean leader, to talk about logistics. And Russian Foreign Minister Sergei Lavrov has arrived in Pyongyang for talks. He told Russian media he wanted to understand North Korea's position. Mr Lavrov also spoke to Mr Pompeo for the first time on Wednesday, by phone. White House spokeswoman Sarah Sanders confirmed the US and North Korean leaders still planned to meet next month.